While the boys were away this weekend camping with our Trail Life group (more on that tomorrow) Carlie Jean and I had some time to ourselves. I wanted to make our time fun, but also useful. 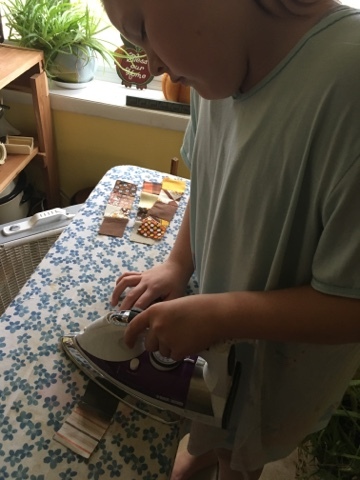 We talked and looked through her American Heritage Girls book to find some badges that she could be working on and I thought it was a perfect time to accomplish something fun. One badge she picked out was "Textile Arts". 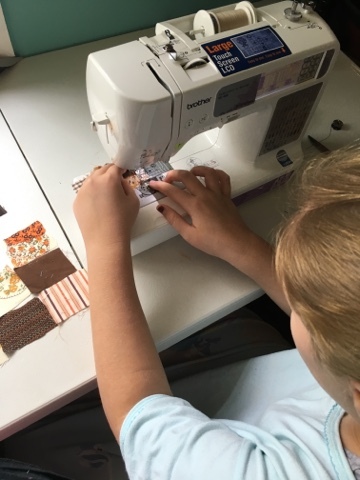 For her age, she will pick out 4 different textile arts and learn a little about each as well as make a small sample of each. 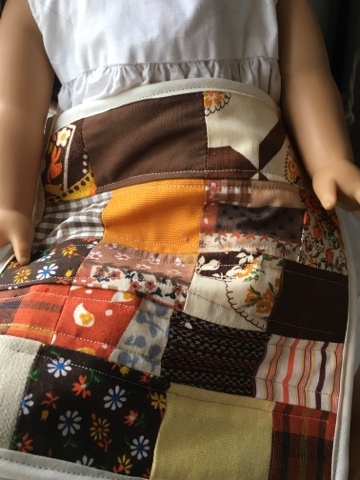 We began with quilting. So is the case with the fabric scraps above. I was given a bag of tiny rectangles, that I have NO DOUBT in my mind... that they came from the 70's. My bag was FULL, and what colors does my girl pick out? The very same ones that her Moma would. The browns, gold, oranges, rust... I LOVE IT! 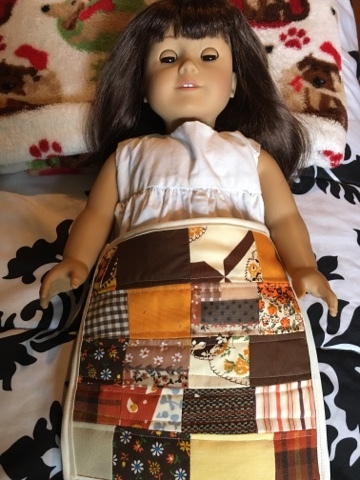 We decided a small doll quilt would be a great beginner project for her. 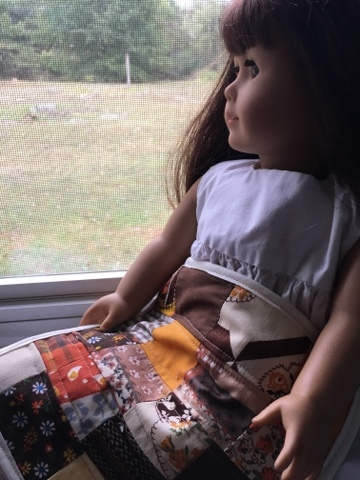 My aunt allowed me to borrow her sewing machine for a little while. *** One day I need to have one of my own again*** So we got started. 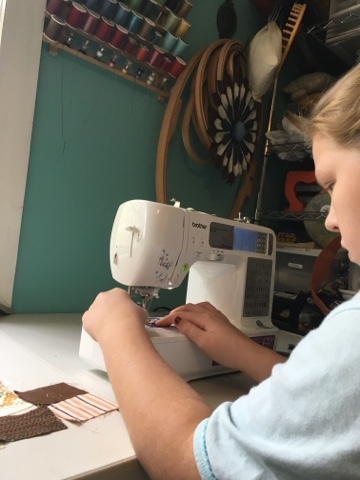 Carlie laid out the placement of the fabrics and I showed her how to sew the seams together to make the quilt rows. 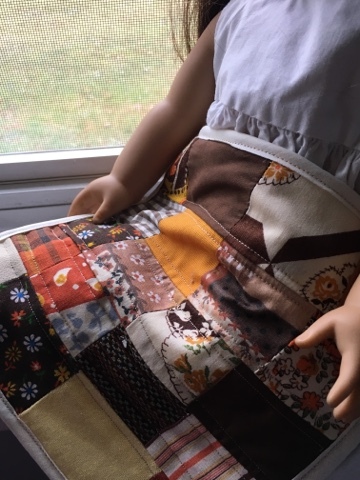 She took the rows and pressed the seams and sewed everything together. 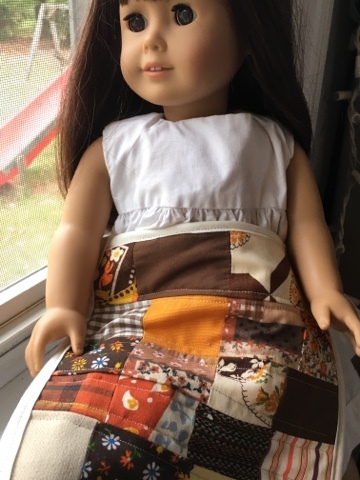 We sandwiched the doll quilt top, the batting, and the back muslin and machine quilted straight lines down each side of the 'stitch ditch'. 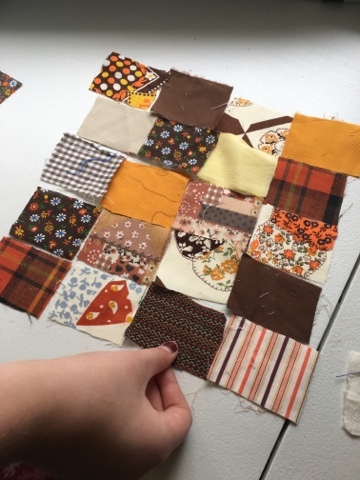 Then we used a bias tape to bind the quilt. It turned out so sweet and Carlie was very pleased with her finished project. And I am pleased with her excitement to learn new things and her ability to accomplish them with a great sense of achievement.